Many of us have amassed large libraries of books over the years. Most avid readers have at least one book reader. The convenience of having several books in one little device is a convenience that causes many people to give up their paper books for electronic versions. The question that many people ask is if they can convert all of their paper books so they can have a copy on their e-book reader. It seems to make sense on its face but copyright laws are very murky and there is no clear answer. At one time a book can be copyrighted for 15 years and then it would go into the public domain. Over the years the window has expanded as big media companies have lobbied congress to keep adding years to the end. Unless something significant changes in Washington you can expect all books controlled by large media companies to never go into the public domain. The applicable part of the copyright law is Title 17. Also referred to as “fair use.” Scanning is in effect a copy of the work so that is the section of the law that is most commonly used as a basis for legal decisions. Fair use allows for copying of writings for the private study, scholarship, and research. So the first hurdle is that it is not for commercial use. There are also limitations on how much can be copied. It does allow for a chapter of a book or a the whole book if it is not available at a “fair price.” Fair price is generally considered books that are unavailable or out of print. This would seem to exclude books that you could get at the local bookstore or Amazon. Since we don’t have the powerful lawyers to defend the copying of books in copyright we only offer scanning of books when they are out of print or if you own the copyright. 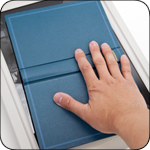 Get a Free No-Hassle Quote on Book Scanning Today! If your project qualifies, our experts can help! From Document Scanning to Records Storage, our experts will help you select a customized Document Management Solution that fits exactly what you’re looking to do for your company. We have locations all across the United States to serve your needs.